Do you need a server or are tired of having to maintain a server in your office? Are you an Accountant, Bookkeeper, Tax Preparer, CPA or other accounting professional? Do you have multiple applications that you need access to and don’t want multiple ways of accessing? Do you have clients that need to access as well? This webinar is on the Cloud9 Virtual Server for accountants solution. Learn how you can outsource your server and IT! Stop the chaos and streamline your practice! Virtual Servers are the wave of the future and are a value savings alternative to traditionalal office servers. Virtual servers allow you real time access anytime, anywhere – and you can even private label your office portal for clients to login to their files! 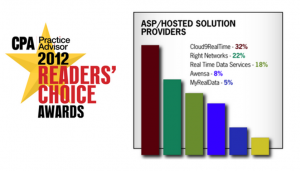 Register now, discover what all the hubbub is about and why Cloud9 Real Time was voted #1 cloud host by a majority of accountants in the most recent Annual Readers’ Choice of CPA Practice Advisor.